The Laboratory Peristaltic Pump You Can Trust! Gilson’s MINIPULS Evolution is the brand-new peristaltic pump specifically designed to meet today's customers' laboratory liquid handling needs with its modern design combining great performance, ease-of-use, flexibility and safety ... The MINIPULS Evolution combines microprocessor speed control with a high-torque stepper motor. 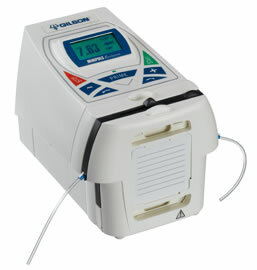 MINIPULS Evolution ensures reliable liquid transfer even in the most challenging laboratory environments. Safe and durable design, pump head with stainless steel rollers, spring loaded cartridges and stepper motor. MINIPULS Evolution is easy to install, simple to operate and easy to maintain. Tubing leaks can be detected easily. Excellent flow rate accuracy and reproducibility with low-pulse flow. Accommodates a wide range of flow rates and back pressures, depending on your application. Perfect adjustment for low flow rates. Extremely fast tubing change with pump head cartridges that can snap in & out. No more need to remove the pump head from the speed control module. Pump heads can be changed within seconds even while pump is operating - no tools required. Optimum capacity with the addition of up to 16 channels on the same module. Simple and fine pressure adjustment prolongs tubing life! * MF and HF pump heads are delivered with their cartridges. Any applications requiring flow rates ranging from perfusion of animals in medical/pharmaceutical research up to feeding Bioreactors during fermentation. – PVC (Tygon®) for general use. – Silicone (Versilic®) for biological. – Fluoroelastomer (Isoversinic®) where high-chemical resistance is required. – PharMed® for pharmaceutical and food. Pump head with up to 6 rollers. 3 fully interchangeable pump heads. Stackable pump heads up to 16 channels. Reproducibility of flow rate on all channels with a variation ≤ 0.1%. Possibility to use medium and high-flow pump head in the same module. 0.01 rpm readability below 10 rpm. Snap in & out cartridges.